ww2dbaseOmar Nelson Bradley was born near Clark, Missouri, United States on 12 Feb 1893. His father, John Bradley, was a school teacher and his mother was a seamstress; the family was relatively poor. At the age of 13, his father passed away. He and his mother moved to Moberly, Missouri, where she would remarry. He graduated from Moberly High School in 1910 and worked as a boiler maker at the Wabash Railroad, saving his wages to attend the University of Missouri in Columbia. Encouraged by his mentor at the church he attended, he took the entrance examination for the United States Military Academy at West Point, New York, United States; he failed to achieve the first place, but was still able to secure the Congressional appointment to attend as the first place candidate chose to give up the opportunity. At West Point, he was a star baseball player and had joined the local Masonic Lodge in Highland Falls, New York. He graduated from the US Military Academy at West Point in 1915, becoming a junior officer with the 14th Infantry Regiment. In 1915, he served on the US-Mexican border. When WW1 began, he received the wartime rank of captain and was in charge of guard the copper mines in Butte, Montana, United States. In Aug 1918, he joined the 19th Infantry Division, which was scheduled for deployment to Europe, but he would not see action before the war's end. ww2dbaseBetween 1920 and 1924, Bradley taught mathematics at West Point. 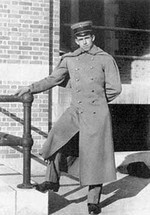 He was promoted to the rank of major in 1924, and took the advanced infantry course at Fort Benning, Georgia, United States. After serving in Hawaii, United States briefly, he studied at the Command and General Staff School at Fort Leavenworth, Kansas, United States between 1928 and 1929. In 1929, he returned to West Point as a instructor. In 1934, he studied at the Army War College. In 1936, he was promoted to the rank of lieutenant colonel and was transferred to the War Department. In Feb 1941, he was promoted to the rank of brigadier general, bypassing the rank of colonel, to command Fort Benning; he was the first in his West Point graduating class to become a general. In Feb 1942, he became the commanding officer of the 82nd Infantry Division. In Jun 1942, he was transferred to become the commanding officer of the 28th Infantry Division. ww2dbaseWhile working directly under George Marshall in the 1930s, Bradley's ability did not go unnoticed. When the United States Army was finally ready for major offensive action in late 1942, however, he was not given the chance to lead at the front. He was finally sent to the front in early 1943 to aid Dwight Eisenhower, arriving on 24 Feb 1943, where he was credited with the reorganization of the devastated II Corps; he was assigned to serve under II Corps' commanding officer, George Patton, after the reorganization. In Apr 1943, he took over the command of II Corps. At the end of the Desert War, in Jun 1943, he was promoted to the rank of lieutenant general. During the invasion of Sicily, Italy, he continued to lead the II Corps. 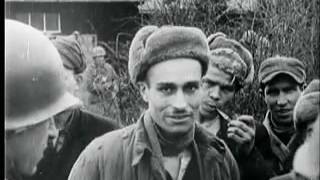 ww2dbase"My high opinion of Bradley, dating from our days at West Point, had increased daily during our months together in the Mediterranean", said Eisenhower. "He was a keen judge of men and their capabilities and was absolutely fair and just in his dealings with them. Added to this, he was emotionally stable and possessed a grasp of large issues that clearly marked him for high office." ww2dbaseTransferred to Britain, Bradley was named the commanding officer of US 1st Army, consisted of three corps, for the planned invasion of Western Europe. On 10 Jun 1944, four days after the initial invasion at Normandy, France, he arrived in France and established a headquarters. He played a major role in the planning of the successful Operation Cobra in Jul 1944 which saw the Allies breaking out of the Normandy beachheads. By this time, as the head of the 900,000-strong 12th Army Group, with his former superior Patton reporting to him, he commanded the largest group of soldiers for a single field commander in the US Army. During the Battle of Falaise, troops under him formed the southern pincer that, together with the northern pincer collectively, failed to close the gap to trap a large number of German troops inside; as he had halted Patton's advance during the battle to prevent American troops from attacking into sectors assigned to British and Canadian troops, this failure would remain Bradley's biggest regret in his WW2 career. As the Allies reached the German Westwall defenses (known to the Allies as the Siegfried Line), Bradley favored an advance into the Saarland, but Eisenhower chose Bernard Montgomery's plan to launch Operation Market Garden despite Bradley's protest. In late 1944, as the German Army launched its final major offensive in what would later become known as the Battle of the Bulge, his troops took the initial brunt of the German attacks; due to tactical situation, Eisenhower sidelined Bradley and placed his US 1st Army under Montgomery's command, which created a further divide between Bradley and Montgomery. ww2dbaseBradley was promoted to the rank of four-star general on 12 Mar 1945. Although no less aggressive than fellow Allied generals, he was rather uncharacteristically courteous, sometimes using the word "please" when issuing orders. Nicknamed the "GI's General", he was known for his patience when working with subordinate generals, although he had also fired many for mistakes committed. ww2dbaseAfter WW2, US President Harry Truman appointed Bradley to head the Veterans Administration for two years. In 1948, he succeeded Eisenhower as Army Chief of Staff. In 1949, he was appointed by Truman to become the first Chairman of the Joint Chiefs of Staff. In Sep 1950, he was promoted to the rank of General of the Army, the fifth and final US Army general to attain that rank at the date of this writing. In the same year, he was made the first Chairman of the North Atlantic Treaty Organization (NATO) Military Committee, a position he would hold until he retired in Aug 1953. During the Korean War, he initially supported the invasion and occupation of northern Korea, a notion shared with Supreme Allied Commander Douglas MacArthur, who also shared a mutual distrust with him. When Communist China entered the war, however, Bradley changed his strategy to merely containing the expansion of communism in Korea. This deepened the gap between MacArthur and Bradley, ultimately leading to Bradley's decision to support Truman's firing of MacArthur. In a testimony at the United States Congress, Bradley noted that he believed a continued war in northern Korea "would involve us in the wrong war, at the wrong place, at the wrong time, and with the wrong enemy." ww2dbaseBradley held a number of positions in the civilian sector after retiring from the US Army in 1953, including becoming the Chairman of the Board of the Bulova Watch Company from 1958 to 1973. His memoirs were published in 1951 under the title A Soldier's Story. In the 1960s, he was one of President Lyndon Johnson's "Wise Men" group of advisors regarding Vietnam War matters. In 1965, his wife Mary died from leukemia. On 12 Sep 1966, he married his second wife, Dora Buhler. In 1970, he was a consultant for the film "Patton". He passed away in New York, New York, United States from cardiac arrhythmia in 1981. He was buried at the Arlington National Cemetery in Virginia, United States, where he now rests with both of his wives, Mary Quayle and Esther Buhler. The autobiography A General's Life was posthumously published in 1983; it was begun by Bradley and completed by Clay Blair. 12 Feb 1893 Omar Bradley was born near Clark, Missouri, United States. 27 Jun 1911 Omar Bradley received a letter from Congressman William Rucker noting that Bradley could attend an examination for entrance to the United States Military Academy at West Point, New York, United States as his secondary appointment. 27 Jul 1911 Omar Bradley received a telegram noting he had been accepted into the United States Military Academy at West Point, New York, United States. He was to report in at the academy before noon on 1 Aug 1911. 30 Jul 1911 Omar Bradley departed Moberly, Missouri, United States by train. 1 Aug 1911 Omar Bradley entered the United States Military Academy at West Point, New York, United States. 12 Jun 1915 Omar Bradley was promoted to the rank of second lieutenant. 13 Oct 1916 Omar Bradley was promoted to the rank of first lieutenant. 22 Aug 1917 Omar Bradley was promoted to the rank of captain. 17 Jul 1918 Omar Bradley was promoted to the temporary rank of major. 4 Nov 1922 Omar Bradley was reverted to the permanent rank of captain. 27 Jun 1924 Omar Bradley was promoted to the rank of major. 22 Jul 1936 Omar Bradley was promoted to the rank of lieutenant colonel. 24 Feb 1941 Omar Bradley was promoted to the temporary rank of brigadier general. 18 Feb 1942 Omar Bradley was promoted to the temporary rank of major general. 24 Feb 1943 Omar Bradley arrived in French Algeria. 9 Jun 1943 Omar Bradley was promoted to the temporary rank of lieutenant general. 11 Jul 1943 Omar Bradley arrived at Sicily, Italy while recovering from a recent hemorrhoidectomy. 13 Nov 1943 Omar Bradley was promoted to the permanent rank of colonel. 1 Aug 1944 The US 12th Army Group came into existence under the command of Lieutenant General Omar Bradley. 14 Jan 1945 Dwight Eisenhower wrote to George Marshall recommending Omar Bradley to be promoted to the rank of a full general, citing Bradley's past success and the need to close the rank gap between Bradley and British Field Marshal Bernard Montgomery. 29 Mar 1945 Omar Bradley was promoted to the temporary rank of general. 4 Apr 1945 General Dwight Eisenhower transferred the US 9th Army from Field Marshal Bernard Montgomery's 21st Army Group to General Omar Bradley's 12th Army Group, thus making Bradley the first American general to command four field armies simultaneously. 4 Jul 1945 General Omar Bradley took control of the American sector of Berlin, Germany from the Soviets. 31 Jan 1949 Omar Bradley was promoted to the permanent rank of general. 11 Aug 1949 Omar Bradley was appointed the first Chairman of the Joint Chiefs of Staff. 22 Sep 1950 Omar Bradley was promoted to the rank of General of the Army. 12 Sep 1966 Omar Bradley married his second wife, Dora Buhler. 10 Jan 1977 Omar Bradley was presented with the Presidential Medal of Freedom by President Gerald Ford. 8 Apr 1981 Omar Bradley passed away in New York, New York, United States from cardiac arrhythmia. Bradley, while he had his flaws, was an outstanding tactician and his Operation COBRA was one of the great efforts on the Western Front. It was a pleasure getting to know "Brad" as I researched "Brothers Rivals Victors." Great short bio!